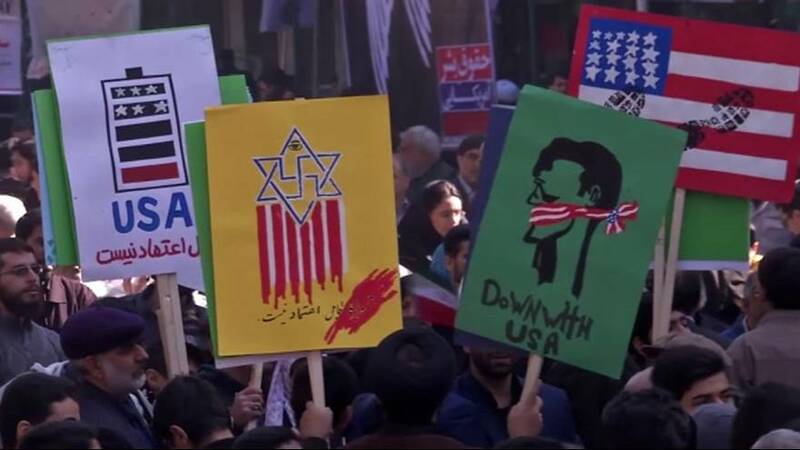 Thousands of protesters have rallied in the Iranian capital to mark the anniversary of the takeover of the US Embassy in Tehran. The demonstration saw activists chant ‘‘Death to America’‘ and other anti-US slogans. Protests are held every year in front of Washington’s former diplomatic seat in Iran which was seized 37 years ago. “We are here to chant slogans, and our slogans are a strong punch in the face of America. America can never touch our country, and as our leader said, America can’t do a damn thing,” one protester said. Demonstrators also burned US and Israeli flags, as well as a giant Star of David, during Thursday’s protest. The anniversary marks the moment Iranian students stormed the embassy on November 4, 1979. During the seizure 52 Americans were taken hostage for 444 days after Washington refused to had over Iran’s toppled Shah. The hostage crisis led to the US permanently breaking diplomatic relations with Iran in 1980.